Jay Oliver grew up in St. Louis, Missouri, surrounded by the vocal harmonies of his jazz singing parents, and he regularly joined them – at a very young age – as they frequented the thriving local jazz club scene. Born with perfect pitch, he quickly formulated his musical sensibilities and by four years old was playing short jazz pieces from memory. After years of studying and performing locally, he branched out and began composing, engineering, producing and helping other aspiring musicians like Sheryl Crow cultivate their talents. Oliver eventually relocated to L.A. to employ both his intuitive instincts and his command of a broad range of musical styles as a session recording artist, working with notables such as jazz great Dave Weckl and popular icons Glenn Frey and Jimmy Buffett. 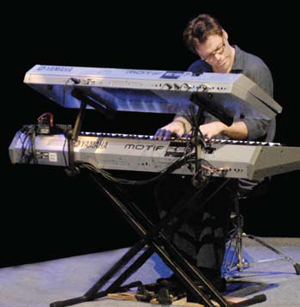 As Oliver matured into a highly sought after “musician’s musician,” his career evolved beyond masterful dexterity and technique for technique’s sake – what he and his fellow musicians referred to as “dig me digging me.” Instead, he began to notice a deeper power hidden inside simpler and more inspirational expressions of music. Eventually he joined forces with long time friends Rick Gannaway to create AO Music, and Washington University Professor William Lenihan to create SoundScience, a new company that produces innovative audio-based products for healing, relaxation, and, cognitive advancement and sleep in infants. SC: You’ve said that even when you were very young, you just “knew” music. How did that knowingness play a part in your success as a musician? JO: I suppose it was like being born with a sixth sense of musical harmony, a language I had already known once before, perhaps in a previous life, and this time around it came easy and was never much of an issue for me. This helped me to be able to “see” music in my mind and imagination. As I evolved into an improvisational musician, I further cultivated this by learning to invoke a state of visualization, similar to meditation, where I would imagine playing solos. I learned to make this so real in my mind that I could actually feel my finger muscles moving, even though I was not actually sitting at my keyboard. Developing this technique completely revolutionized my ability as an improvisational musician. SC: And you were already one of the busiest musicians and producers in St. Louis. What was your motivation to move to L.A.? JO: If we subscribe to the theory that everyone’s reach should be just beyond their grasp, then LA or NY was the next chapter for me. My friend Sheryl [Crow] had already moved to LA and was ready to introduce me to many people. Also my other music partner and close friend Rick Gannaway was urging me to move there. 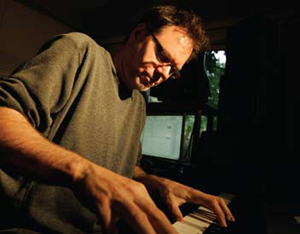 Rick later became my partner in the AO World Music Project. SC: Let’s talk about AO Music. You refer to it as “Pan-Cultural” as opposed to “world music.” What is the distinction? JO: We were very careful not to use the term “world music” because it generally refers to music that came from somewhere else. Our aim was to make a new kind of music that comes from EVERYWHERE. We approached AO Music very differently by using a tree as our working model. The most poignant and profound power that a tree carries is in the root, more so than the trunk, and absolutely more than the branches. We wanted to build substance in the music from the roots – not add another branch to the tree. Mainstream music today is not very original. It’s a highly derivative art form – the branches spawn branches, which spawn more branches, and so forth. At the end of those branches, it’s hard to find any real power, and I’m talking about that power music has to heal, to inspire and to ignite us emotionally and intellectually. Many people making music today have trouble bringing any real depth into their work because they have no comprehension of the trunk that ties all the different styles together or the roots from which they all emerge. For instance, a young singer today might not think to listen to music before Beyonce or Mariah Carey to fully understand where THEY came from or who Aretha Franklin is or the gospel singers that influenced Aretha before that. Without understanding the many historical influences, both the audience and the musicians wind up being deprived of the deeper emotion that could have been evoked. Over time, a new diluted culture becomes the status quo. The AO Music Project took bits and pieces of music from all over the place, a little bit of Africa maybe in some of the drumming, some chants and tribal voices and maybe some kalimba or other finger harp instruments. We’d take some sounds from Asia, perhaps a sample of a Persian ney and maybe some Irish bouzouki or an Irish pan flute – and we would combine them together into one homogenized sound. Then over the top we layer it with the sounds of ethnic children singing in a concept language constructed phonetically and geometrically rather than one specific meaning or specific preferential vernacular. It’s a very beautiful sound that speaks to you in a way that’s difficult to articulate. SC: You have stated that Brian Eno was one of your greatest influences. How so? JO: His minimalist approach really inspired me. I’d take off and drive north along the coast and listen to his simple music and notice how healing it was for me personally. Here I was, this studied, practiced, technically and harmonically proficient musician, and yet I was so drawn to something so pure and innocent. And within the absence of “feats of excellence”, I found an amazing musical power, in fact, a more selfless power that seemed to make the listener feel better about themselves, rather than to evoke a sense of admiration directed at the performer. That intrigued me and I bought every record that he made. 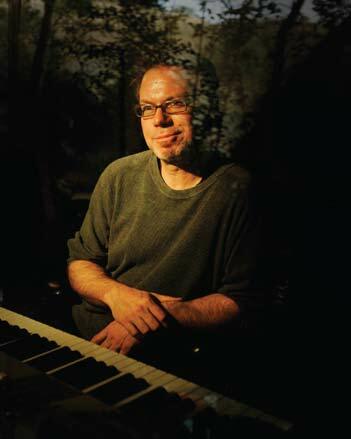 My close friend and partner in SoundScience, William Lenihan, and I spent our early years listening to Charlie Parker, Oscar Peterson, Chick Corea, Al Dimeola and countless other jazz greats….but then we would also listen and study Eno’s work and wonder why something so simple, non-complex, unsophisticated, was somehow so powerful and healing. SC: You are discovering a whole new voice for yourself and contributing towards the creations on many artistic fronts. JO: I’ve been a professional musician for decades yet the most important thing for me right now is working with AO Music and SoundScience in addition to my upcoming solo piano project, that integrates all that I’ve been just talking about, and is a place of exploration for me. All three projects strive to achieve the same goal – to open hearts – and none of them are in any way tied to “artistic indulgence.” In the world of corporate driven music, this is neither popular nor trendy. It has taken me my entire life to get to realize that musical proficiency doesn’t make me a better person. My greatest accomplishments have not been about musical achievement, but to mature as a human being. Only in the last few years have I come to realize there is something else that happens in music that is beyond words, explanations, notes, melody, chords or rhythm. And if I can bring that thing forth through my hands and into the ears and hearts of the listeners, then I can really do something powerful. And I’m still a student, a child of that thing. It’s not a musical practice – it’s a life practice. SC: Describe how each of the three projects are distinct. JO: Well there is my company SoundScience, which produces audio consumer products using technologies that are purely scientific and biological and we know we have discovered some really amazing things. For instance, we have developed a biological soundtrack that is a close emulation of the intrauterine sonic environment, or the sound a prenatal baby experiences inside the womb, and underwater. After a four-year field test, we estimated that 80% of all babies cry far less and sleep far more when the soundtrack is playing. Then there are the AO Music and the JO solo piano projects, which embody the “otherness”, or that quality that has the ability to open hearts. The intent is to move someone to an inspired or transformational place of profound impact. SC: Let’s talk about SoundScience, and how you came up with the Music Is MATH technology. A simple way to understand this technology is to first recognize that music is composed of two disparate functions independent of each other: a pulsed-base time, and, tonality – which are the pitches that are created. The sequence of those pitches is called melody and any combination of pitch is referred to as chords. However, melody and/or chord function independently of pulse-based time as neither is connected to the other because at the most fundamental level of music how the melody moves in pitch has no direct relationship to the meter or the rhythm. So, what we refer to as music is actually two disparate things that are combined together. We considered the possibility that a newborn baby might not yet be able to discern those two disparate functions of music – just as it would be unlikely for an adult to be able to comprehend what two different people talking at the same time were saying. SC: It doesn’t seem like doing that would produce sounds that are familiar. JO: The sonic palette is familiar, but the precise occurrences and notes chosen are purely mathematical and tied and mapped exactly to the interval from which they sprang: The smaller the interval within the melody, the quicker the time and vice versa. So far, we are very encouraged by the feedback we are getting from parents. Some pretty extraordinary stories have found their way back to us. We received a letter from the parents of a baby recently born in Oklahoma that experienced a traumatic birth. The doctors were able to save him, but pronounced him a “sleeping baby” – meaning his brain would not fully function and he would never wake up. One of the NICU nurses suggested off the record, of course, that they play the Music Is MATH CD series. Four months later the baby now has full mobility, is sitting upright, and giggling. A neonatalogist there has requested permission to do a clinical study using the CDs, and we are very pleased to see that interest.